I thought New Start was the perfect title for today's post, not only because of the layout below, but because we close on our new house on Wednesday. I can't tell you the whirlwind of emotions I am feeling right now. I hate the thought of leaving Bloomington but I am so ready to get this move overwith. So what better time to create a layout about starting at a new school than now. Took these pictures less than two years ago at the beginning of 3rd grade for L and 5th grade for K. That teacher in the picture with K in the upper left corner is the most amazing teacher you could ever meet. I am in constant awe of everything she does from the way she handles the class to everything she teaches those kids. She goes so far beyond the curriculum. Adore her and I am very sad that L will not have the chance to be in her class. I also have a give away before I go. 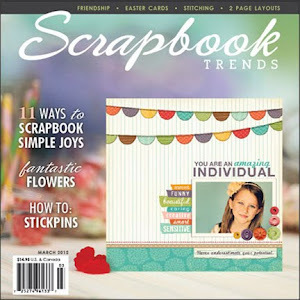 I just got my comp copy of the April Scrapbook Etc. in the mail and since I already subscribe I have an extra copy that I want to give away. So leave me a comment and I will pick a winner next Tuesday. i love your banner picture!! and the lo is totally cute and adorable. good luck w/your move! Congrats on the hhouse and the LO is lovely~the teal color looks great!! The thought of moving does not sound good at all but since that is what it is, getting it going will be good. Great little layout. Good luck in your new home. I'm sure everything will work out. Sweet layout. Lovely layout! Congrats on the new house. Hope it goes smoothly and without problems. Don't enter me (I sub too) but just wanted to say I love the layout! I am always looking for two pagers that still have lots of open space and breathing room! What a whirlwind time for you, Lisa! Wishing you a very smooth transition in your move. Looks like things are in full swing at this point. Love your page! Totally rocking the 2-pager!